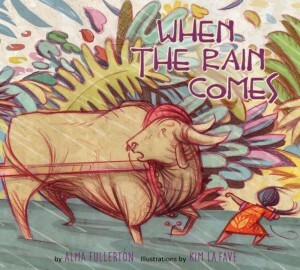 “The moods of Sri Lanka’s rainy season come alive as Kim La Fave, illustrator of the award-winning Shin Chi’s Canoe, uses a fresh style that is both contemporary and impressionistic to depict the courage of one little girl facing the power of a flash flood…. “…Alma Fullerton tells to tale in free verse. She successfully conjures up the sights and especially the sounds of a day in Sri Lanka—the song of the bullock-cart driver, the clop of the ox, the pounding of rain and the cracking of thunder. Kim La Fave’s illustrations magically transform a bedsheet into a flock of birds. He convincingly whips up the wind and slashes rain across the page to convey the frightening immediacy of a flash flood. What did you like about the book? This is a story of a young girl who lives in Sri Lanka….The illustrations and the text both give the sense of gravity and danger to the situation. The blustery wind and the driving wind, along with the cries of Malini’s family urging her to leave the ox and come to safety show the drama of the choice Malini must make. I especially liked at the end of the book when the author explained just how important rice was to the poor people of Sri Lanka and it put Malini’s actions into a context. To whom would you recommend this book? This is a great book to have in a library that fosters multi-culturalism. The story is engaging and children will learn about the culture of Sri Lanka through this book….